What if living in the moment, included the past? 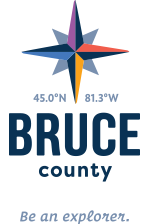 Let time slow down as the history and culture of Bruce County is revealed. Journey through thousands of years of natural and human history, meet the shopkeeper and travel back to a time where residents picked up sugar, bread and the latest news in the General Store. Aboard the HMS General Hunter, “fire a cannon” and defeat the enemy while learning how to properly tie a slip knot to secure your rig. Experience Past, Present & Future Inventions in the Technology lab in the Rise of Community exhibit. Rediscover the significant sacrifices Bruce County soldiers made in Bruce Remembers. Immerse yourself in the rich culture of the First Peoples’ Gallery and learn about traditions that shaped our landscape today. The Bruce County Archives & Research Room preserves the collective memory of the County and makes available our documentary heritage to visitors and researchers alike. With assistance, browse through a variety of documents: Personal Papers, Municipal, Educational, Business and Organizational Records, as well as photos in our multimedia Collections. The Museum hosts a number of special events and programs ranging from live entertainment, theatre, speciality events (Medieval Day), holiday programming, March Break and Summer Day Camp, to featured special guests and more!